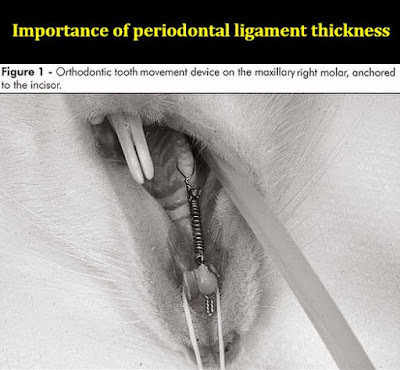 In experimental studies in humans and animals, periodontal ligament (PL) thickness is reported by giving mean values and ranges. For example, mean PL thickness in rats is 0.130 (range, 0.100 - 0.160) mm across the molar region. The maxillary first molars of Wistar rats have an average of five roots of different sizes and diameters. Tooth movement studies in which force was applied to these molars found that responses differed between the larger mesiobuccal (MB) root and the smaller intermediate buccal (IB) and distopalatal roots. These findings raise the question of whether different responses to force application can be explained by differences in root size. Alternatively, because roots are single, solid structures fixed to a tooth that dissipate pressure into the PL along the entire length of the radicular surface, different responses may be explained instead by variation in PL thickness. This study evaluated whether periodontal ligament (PL) thickness varied with root size and examined the possible influence of this variation on orthodontic mechanics. Measurements were taken of the maxillary left first molar in 54 male Wistar rats. Mean mesial and distal PL thicknesses were compared between the intermediate buccal and mesiobuccal roots using paired Student's t-tests with a 5% significance level.